Lemongrass essential oil has a sweet, strong and lemony aroma, with a subtle hay-like and earthy undertone. Lemongrass is a revitalising essential oil that lifts the body and spirit. It is re-energising, reviving and stimulating. This essential oil can be used to refresh and tone tired muscles and loose skin. The deodorising action of lemongrass is also useful for keeping away insects, pests and fleas. The oil is extracted by steam distillation from the fresh leaves that have been partially dried and finely chopped. 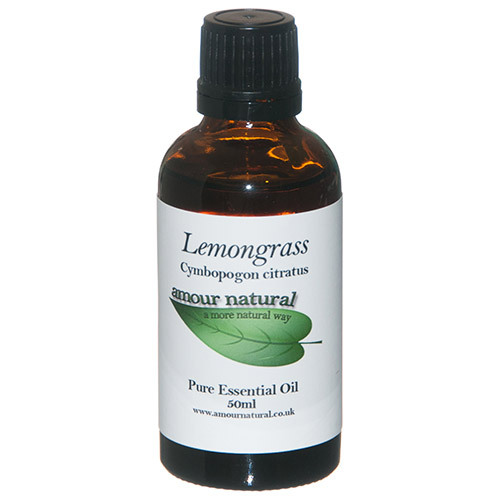 Lemongrass essential oil blends well with bergamot, cedarwood, lavender, rosemary, geranium and other citrus oils. Below are reviews of Amour Natural Lemongrass Pure Essential Oil - 50ml by bodykind customers. If you have tried this product we'd love to hear what you think so please leave a review.